Sunday, 3 February 2019, 12:18p.m. A young girl is on crutches after an "out of control" car rammed into a group of party-goers injuring at least five people. 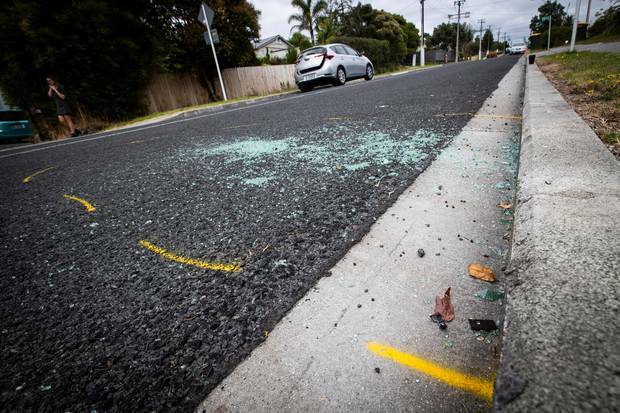 Clayburn Rd resident AJ Hodges spoke to the Herald about the incident this morning. She said broken glass, empty bottles and police markers were all that was left marking the "horrific" incident. Still shaken from last night's mayhem, Hodges said she had spoken to the mother of the injured youngster, who lived in the house where the party was taken place. "She's pretty shaken up but everyone's alive which is the main thing," Hodges said. "I know one girl is on crutches." Emergency services were called to Clayburn Rd in Glen Eden just after midnight. Police say they have spoken to a number of people but no charges have yet been laid. At least five people were transported to hospital after being hit by the car. It is understood the incident happened outside a party on the West Auckland street. One person was in serious condition, and the others had moderate injuries. Hodges said she knew it was serious when she woke to a woman saying "someone call the police and check her breathing." The 26-year-old said she didn't think twice and call the police straight away to be told they had already had multiple calls and were on their way. "Then about five minutes later a paddy wagon turned up and about 10 or 15 cops jumped out. Clayburn Rd, in Glen Eden, where a number of people were injured after a collision with a car outside a party on Sunday morning. Photo / Jason Oxenham. "All the neighbours were out of the street. It all sounded pretty serious," Hodges told the Herald. Hodges said it was pitch black so she didn't get a look at drivers but people were running up and down the street. From what she had been told, Hodges said the car hit the curb before smacking into the group of people on the lawn next door to her. "The car then hit a parked car and a fight broke out between a group at the party and the people in the car." 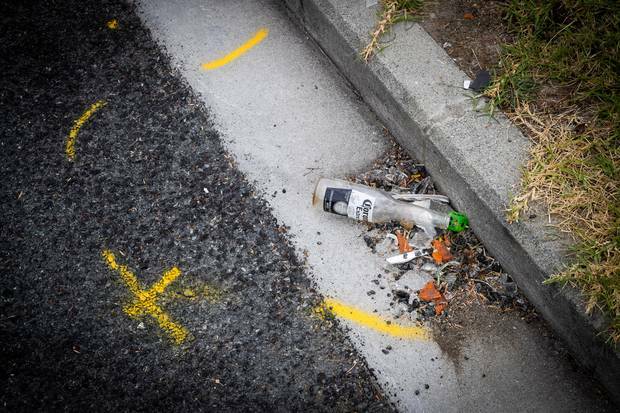 Paint marks a location in Clayburn Rd, Glen Eden, where a number of people were injured after a collision with a car outside a party on Sunday morning. Photo / Jason Oxenham. She said the drivers were unknown to people at the party.